Sewing stretch fabric can be a somewhat daunting prospect, but it need not be difficult! 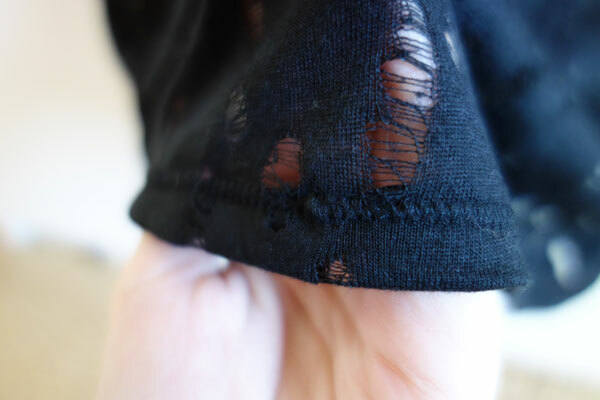 I took on my first experiment with sewing stretch fabric recently when I made a basic knit T-shirt for a friend. Overlocker or regular sewing machine? The great thing about most stretch fabrics is that the edges do not usually need a lot of finishing finesse, as they tend not to fray. Hooray! So, no need to bust out the overlocker, sewing stretch fabric is actually a cinch on a regular sewing machine. Any regular sewing machine with a zig-zag setting is quite capable of producing a lovely, professional-looking result. First up, it's a good idea to change your needle. When we sew woven fabrics, that do not stretch, we use standard sharp sewing needles. Change to a ballpoint needle when sewing stretch fabric. The rounded tip of the needle is much kinder on your garment. This is because stretch fabric is a knitted textile, which is more prone to laddering. On the straight side seams, sew with a regular straight stitch. When you get to the more curved seams like the arm holes, try a shallow zig-zag stitch. This allows the garment to retain enough of its stretch to fit over the body. Another thing to keep in mind when you are sewing your stretch fabric, is to feed it through the machine gently and evenly. Try not to pull on the fabric as you sew, otherwise the finished garment can end up misshapen. It helps to lessen the downward pressure of the sewing foot if you can, to allow you to guide the fabric through without too much pull or resistance. What about hemming and top stitching? For a really nice, professional looking garment, your T-shirt hem and sleeves are best finished with a zig-zag or a twin needle top stitch. This makes sure that the fabric retains some of its stretch and elasticity, even once sewn. For this garment, I finished the sleeves and hems with a zig-zag stitch. Personally, I think a close zig-zag (mid to wide zig-zag setting and a small stitch length) gives a nice finish, but it's really up to you. Play with your machine settings and test it out on a double layer scrap of fabric before committing your stitches to your final garment! If you have a twin needle, you can set up another spindle on your sewing machine for a second spool of thread, and thread up both needles. This method of top stitching results in a perfectly parallel set of straight stitch on the top of your hem, with a lovely little connecting zig-zag on the reverse. Most store bought T-shirts will have this kind of finish. This is the first knit T-shirt I made sewing with stretch fabric. It was a fun project and it's nice to know that even the very basics of a wardrobe can be handmade. There will definitely be more of these!